The Person Matcher application is built upon the SCOUT framework, and utilizes some of its key features, namely entity identification, proximity detection and content filtering. In a nutshell, this application automatically detects other people in the vicinity, performs a detailed compatibility check based on their FOAF profiles, and notifies the user when people are encountered that could be of interest to him. To achieve this, the Person matcher application is continuously provided with FOAF profiles of persons in the vicinity, utilizing SCOUT's Notification Service. After receiving a profile, the application calculates a “compatibility” score, based on a comparison between the FOAF profile of the nearby person, and user’s own FOAF profile (stored in the User Model). The compatibility algorithm is based on finding paths or connections between the two FOAF profiles. This algorithm is configured by a weighting scheme that allows it to be deployed for different purposes; for instance, to find colleagues to collaborate with, or to look for new drinking buddies. Below, we provide a general overview of the approach. For more details, we refer to the demo paper on this application. 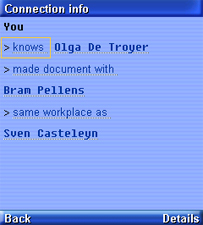 As mentioned above, the user can employ the Matcher application for different reasons (e.g., finding colleagues to collaborate with; looking for new friends). Depending on this reason, some (sequences of) FOAF properties will become more important in the matching process, while others become less important or even irrelevant. For this purpose, the Matcher application can be configured with different weighting schemes (specified in RDF format), denoting which connections between the two persons should be searched for, and specifying scores representing their relative importance. The actual matching algorithm looks for connections between the user’s FOAF profile and the FOAF profile of the nearby person. In this step, the application performs the role of a Semantic Web crawler, crawling both the user's and the nearby person's friend graphs (consisting of friends, and their friends' friends, etc). In this process, RDF profiles of friends are also retrieved to further expand the friend graphs. A relevant connection between both graphs is found when a sequence of links connects the two initial Person nodes. Afterwards, a compabibility score between the two FOAF profiles is calculated, based on the number of connections found (and their assigned scores in the weighting scheme). Below, some screenshots from the application can be found. In fig. 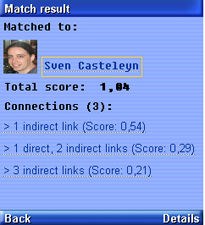 1, a detailed view of a matching result is shown, displaying the total compatibility score, the name of the matched person, his profile picture (if available), and an overview of the found connections between the user and this person. Fig. 2 displays the details of such a found connection; namely, its constituent links and the persons present in the connection. You can find more screenshots of the matching application here.